C. T. R. Wilson was awarded the Nobel Prize in Physics in 1927 "for his method of making the paths of electrically charged particles visible by condensation of vapour." The majority of his career was spent at the University of Cambridge, where he worked at Cavendish Laboratory, the Solar Physics Observatory, and taught as a lecturer, demonstrator, and the Jacksonian Professor of Natural Philosophy. February 14, 1869Birth, Glencorse (Scotland). 1887Obtained BSc, Owens College, University of Manchester, Manchester (England). 1892Obtained PhD in Physics, Sidney Sussex College, University of Cambridge, Cambridge (England). 1894Assistant Master, Bradford Grammar School, Bradford (England). 1895Began researching cloud creation after finding inspiration on Ben Nevis, the highest Scottish mountain. 1896 – 1899Awarded the Clerk Maxwell Scholarship, Cavendish Laboratory, University of Cambridge, Cambridge (England). 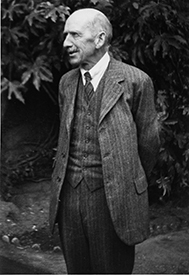 1900 – 1936Fellow; University Lecturer and Demonstator; and Jacksonian Professor of Natural Philosophy (1925-1936), University of Cambridge, Cambridge (England). 1911Awarded the Hughes Medal, Royal Society. 1913Observer in Meteorological Physics and Reader in Electrical Meteorology, Solar Physics Observatory, University of Cambridge (now called the Institute of Astronomy), Cambridge (England). 1920Awarded the Hopkins Prize, Cambridge Philosophical Society. 1921Awarded the Gunning Prize, Royal Society of Edinburgh. 1922Awarded the Royal Medal of the Royal Society. 1925Awarded the Howard Potts Medal, Franklin Institute. 1927Awarded the Nobel Prize in Physics "for his method of making the paths of electrically charged particles visible by condensation of vapour". 1935Awarded the Copley Medal, Royal Society. November 15, 1959Death, Pentland Hills (Scotland). Advised by Wilson at Cavendish Laboratory, University of Cambridge. Collaborated at Cavendish Laboratory, Cambridge University. Share the 1927 Nobel Prize in Physics for separate prizes. Fellow; University Lecturer and Demonstrator; Jacksonian Professor of Natural Philosophy; and Observer in Meteorological Physics and Reader in Electrical Meteorology at the Solar Physics Observatory. Awarded the Hopkins Prize (1920). Clerk Maxwell Scholar and Researcher. Awarded the Howard Potts Medal (1925). Fellow and awarded the Hughes Medal (1911), the Royal Medal (1922), and the Copley Medal (1935). Awarded the Gunning Prize (1921). Received PhD in Physics (1900). Received BSc (1887), Owen's College. C. T. R. Wilson laboratory records and notebooks, circa 1895-1940. Charles Thomson Rees Wilson papers, 1890-1959. Dept. of Special Libraries and Archives. Laboratory records and notebooks [microform], 1895-1940. Letter to F. A. B. Ward, March 26, 1935. Three letters to F. S. Taylor/C. T. R. Wilson, 1954 April 12-27. Edmund C. Stoner papers and correspondence, 1909-1969. Items in various series of The Royal Society, 1891-1906. Oral History interview with Philip I. Dee, 1971 November 5. Oral History interview with Sir William Lawrence Bragg, 1969 June 20. Richard Whiddington papers and correspondence, 1907-1973. C. T. R. Wilson Nobel Prize biography. Royal Society Biographical Memoirs of Charles Thomson Rees Wilson, 1869-1959 by P.M.S. Blackett.